I bought this lathe from a friend who had it stored in his garage. He had inheirited it from someone years ago, and had no use for it. I took it apart, cleaned and lubricated it, and put it back together. The paint is original. Now to build a proper stand for it. Your pic of the lathe is alot better looking than mine, most of the blue paint is wore off. I found a manual on Sears website saying it was made in June 1938. I'm still using the original motor. I have put an on/off switchbox beside the lathe to be able to switch it on and off without reaching over the lathe. That seemed dangerous! Having fun turning pens and peppermills. I found this lathe was made in 1938. Working strong, made over 200 writing pens out of wood, acrylic, and corian. It is a real workhorse. Having trouble with the bearings freezing up, need to replace these. Need to get carbide tiped knives too. 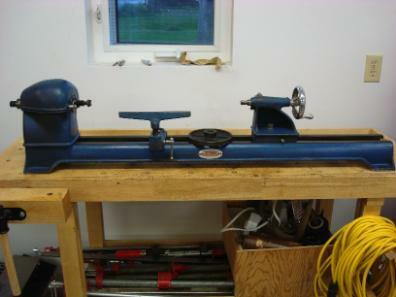 I'm looking to sell a Craftsman Lathe Model No. 101.06242 high quality. Can you tell me what to ask for it. I have the exact same lathe. I purchased it for $50 two years ago. It is in perfect working order, just needed to add a motor and a belt. I have used it and it works beautifully, not as good as a brand new one, but it is nice to use an antique. I am working on a project right now, and I need to have a longer bed on the lathe, but I can't find anyone who has bed extensions. I was told by an antique dealer not to sell it for less than $900! Can anyone help me find any type of owner?s manual of instructional guide how I use my lathe model # 101.06241 that an elderly man gave me? I used a lathe once in school shop about 25-30 years ago. How can a duplicate another piece of wood as a template? I have a very similar 101.06241, or so I think that is the number for mine. My tag is missing. I need the cross slides and tool holder for metal cutting on this machine. Can anyone help? I've got one for sale (It's got the small metal logo plate that says: Atlas Quality Shop Equipment since 1911, Atlas Press Co. I can send some photos - problem obviously would be cost of shipping, but if you are here out West, might be doable. Please feel free to pass this posting on to anyone who you know who might be interested. Hello, would appreciate info on this lathe. On the outboard side of my lathe, if I don't have a stop collar with a set screw on ot the spindle will move 1 inch to the right. I picked up my dunlap lathe at a tag sale for $20.00 and wold like to find the rest of it so I can possable use it . I have now moter and most of the thing is missing . I too have one am trying to find a spindle shaft for mine. The spindle shaft is worn and need a replacement shaft any ideas where I might find one? I have one too. mine works wonderfully. I am however looking for a face plate for mine. It has 1 inch left hand threads in it . if you can help contact me . i just got this same lathe in a trade i made. it works great and i love to use it . i do however need a face plate for mine . I have the same lathe as well. I just got it from my father who inherited it from his father. Mine does not work at this time because I think it needs a motor. Any idea on where I can get one? I just picked up an identical lathe,for $10 at a barn sale, im not a woodworker but it sounded incredibly cheap, I just had to unbolt it. it also came w/set of 8 tools,motor works forward /reverse ,any idea of value?! ?